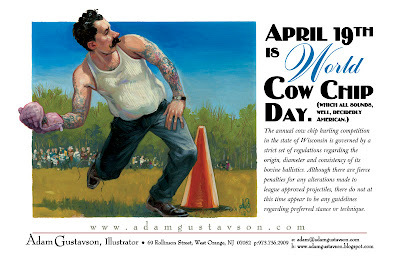 Saturday is World Cow Chip Day! 2008, oil on paper, 9.5" x 12" . My latest contribution to the "Drawer Geeks" club. The theme this time around was "triplets," implying anything coming in a set of three. My wife gave me a long, strange look after I finished it. I still haven't figured out how the three brains work together or against each other, but I'll let you know if I do. Right now, I figure that our young man has mostly monocular vision, like having a lazy eye, but that periodically the role of vision shifts from one brain to another, and with it goes control of his body and will. The blue eye is probably right handed, the brown one left handed, and the green ambidextrous, though I'd imagine it also represents his more sociopathic self. 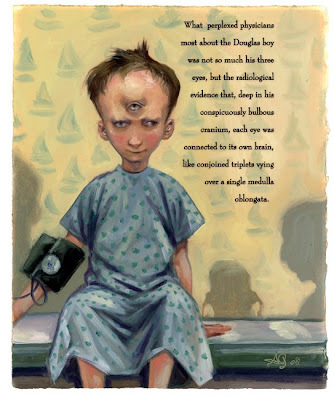 He has a lot of cowlicks, and his left-eye cerebellum was slow to potty train. When asked to join in an online club of cartoonists, illustrators and animators called "Drawer Geeks" with the promise of biweekly random assignments, how could one possibly say no? How could one resist the gleeful clicking of heels and a quick girlish squeal? This is my first contribution, or at least the first I managed to finish on time. Knowing almost nothing about the samurai outside of video game I once played in 1988, I thought limiting my research to an hour peering at such men of mystery photographed in the 1800s would be far more honest than trying to get any of the ancient armor right. I gathered at least that they didn't smile a whole bunch, but were prone to fabulous coiffures and some very cool high domed woven hats, the sort of haberdashery I, personally, could never pull off. 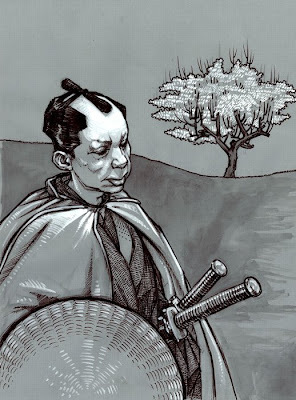 It is unfortunate, however, that a sheathed pair of samurai swords from almost any angle looks like an act of sepuku.